Heated swimming pool available. 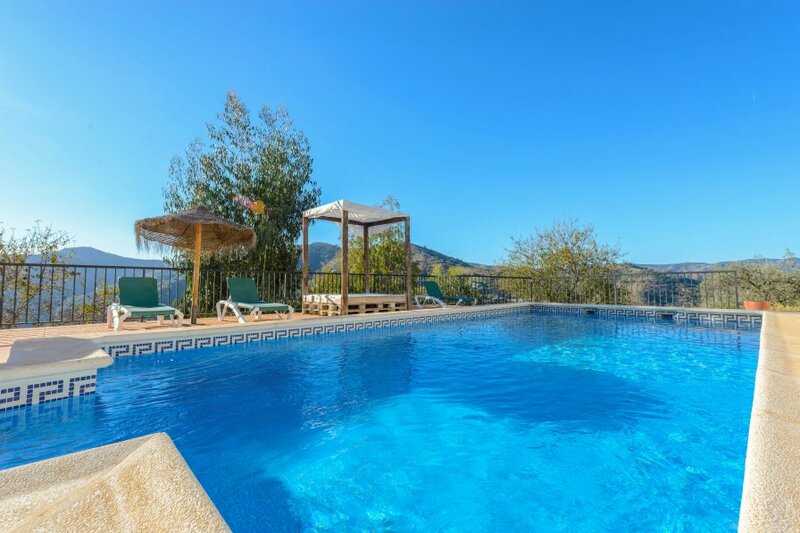 In an excellent location in the middle of almond and olive tres, with magnificent views of the Earth and the mountains. The villa is located in the countryside a short distance from the road. It is a House with a beautiful swimming pool and terraces with shade to enjoy eating outdoors. There is also a summer kitchen on the terrace. All with the fantastic views. The House is well equipped and furnished to an excellent standard. There are 3 bedrooms in the main house and 2 bedrooms in an attached apartment. Torre del Mar is the nearest beach and is a 30-minute drive. It has an attractive beach and seafront where you will find bars, restaurants and entertainment for adults and children. Pedregalejo, 5 km west of the Centre of Malaga, is another beach and promenade with numerous bars and restaurants. Nerja with its famous caves and stunning views over the Mediterranean is 1 hour away and is a beautiful drive.